Digital Transformation – Enterprise APIs programme information. An API — or application programming interface — is a way to provide a system with a programmatic means to access specific data or functionality from another system. One well-known example of how we use APIs at the moment is the Pure widget. This uses the API of our research information system, Pure, to display researchers’ profile information on the University website. Pure widget — embed a Pure profile on your website. The Service Management team asked us to help them build a picture of their target audiences to help them prioritise their work to develop the service. We developed an understanding of users’ current attitudes, behaviours, working practices and aspirations with regard to the API Service, APIs, and other ways of interrogating data. We kicked the project off by holding a workshop with representatives of the API Service team to identify the focus of the first phase of research. We also worked with the team to identify what they didn’t know, and what they most wanted to learn through the user research. Ahead of the workshop, the expectation was that the research would primarily engage with the University’s developer community. But it quickly emerged that other user groups (including project managers, business analysts, etc) also had a strong interest in the API Service, and that the service would need to be designed to meet the needs of these people as well. Following the workshop, we developed a research plan to meet the aims that were established. The API Service team were keen to learn about the extent of demand for their service from potential users in Schools and other local areas of the University. So, through various mailing lists, we sent out an open invitation for research participants with an interest in APIs. This enabled us to access a wide variety of volunteers. In the first phase of research, we conducted six one-to-one interviews with a range of API users, current and potential, throughout the University. We spoke to developers, technical architects and service owners from a range of central services and Schools. Each of these interviews began by exploring attitudes surrounding APIs from an open perspective, and later turned to the prioritised areas of focus identified by the service team. This enabled us to build a full picture of people’s attitudes towards interrogating data, and their aspirations with regard to working with APIs, as well as gaining insight into some of the more specific questions identified by the project team. With the baseline level of understanding established through the interviews, we ran a user engagement workshop. There, service users collaborated with representatives of the API Service. Together, participants developed empathy maps and journey maps. The empathy maps fed into the creation of personas (described below). 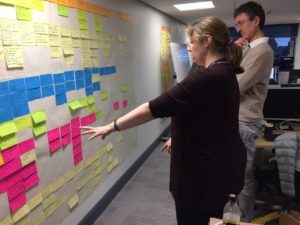 Working with journey maps provided us with a deeper insight into the steps users go through when working with APIs, and the key pain points to be addressed. The personas that have been developed for the API Service are based on the insights we discovered during the one-to-one interviews, as well as items from empathy maps developed during the user engagement workshop. An empathy map is a tool to help you understand what your users are doing and how they are feeling. By getting representatives of our target audiences to complete the empathy maps during the workshop, we got direct evidence of users’ behaviours and attitudes. 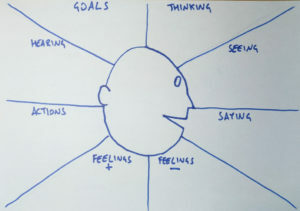 Elements from the empathy maps have formed the basis of the personas. The personas are a representation of four user archetypes that we have identified during the course of our research. The API Service team will be able to use the personas to better understand the perspective of their users. The personas will also provide a framework through which the team can prioritise features according to user demand. The journey map shows users' steps, thoughts and pain points as they work with pulling data from one system to another. By this stage, we were also in a position to build a journey map for the API Service. The starting point for the journey maps actually came while we were still interviewing people. After the first couple of interviews, we began finding the patterns, mapping out the steps users had told us about, and documenting the thoughts, feelings and pain points that users told us about for each of those steps. As our insight developed, so too did the journey map. The workshop served to verify our understanding, and add further detail that had not been picked up during the interviews. As with most UX deliverables, the user journey map is best thought of as a living document. It will evolve over time as our understanding of the service’s users develops. The journey map has been stationed next to IS Apps developers who are working with APIs. By placing it in a prominent location, we have created a talking point. This promotes users’ needs to the API Service and other stakeholders. Users and stakeholders are invited to interact with the journey map, and update it as they see fit according to their own understanding. On creating the first versions of the personas and journey maps, the first phase of user research was complete. The next step was to review our insights so far, feeding into the second phase of research (to be covered in an upcoming blog post). I will be presenting a lightning talk about this project as part of the UX Showcase on Wednesday 4 April. Materials from the research will also be on display, and I will be on hand to discuss this work in further detail. Showcase of UX Service projects — find out more and book a place. If you would like support conducting user research to enhance your service or project, get in touch. Contact the University Website Programme.